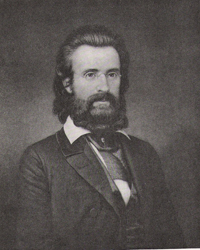 Andrew Jackson Davis (August 11, 1826 – January 13, 1910) is remembered as a “seer” – in effect, a clairvoyant able to enter into a higher state of consciousness and access information otherwise unavailable to humans. In a trance state, he could diagnose illnesses and recommend cures and give lengthy lectures on esoteric subjects, in spite of the fact that he had a very limited education. He is said to have been able to read closed books and to see the body as if it were transparent. He discussed the existence of Neptune and Pluto before their actual discoveries, predicted air travel, and discoursed on the theory of evolution a decade before Darwin published On the Origin of Species. His primary teachings, however, were on death and man’s state after death. “Death is the word used to signify ‘the end of life,’ spoken by persons who see not that seeming death is really ‘the beginning of life,’ and the opening of the sacred volume of eternity. But let us peer through the seeming, into that which is within the veil. “The person is now dying; and it is to be a rapid death. Observe something about temperature. The feet are cold; the hands hot and white; a coldness pervades the entire cuticle. See? What is that accumulating in the atmosphere just over the pillowed head? It is an ethereal emanation – a golden magnetic halo – a throbbing, almost self-conscious atmosphere. “The bodily temperature is now lowering rapidly. The coldness has extended upward from the toes to the knees, and from the fingertips to the elbows; while, in exactly the same ratio, the emanation has ascended higher over the head. The arms are now cold to the shoulders, and legs to the hips; and the emanation, although not higher in the air, is more expanded, with a compact white center, resembling the bright nucleus of a miniature sun. This brilliant central spot, is, in very truth, the brain of the new spiritual organism now forthcoming. “The death-cold steals over the heaving breast, and around on either side the temperature is greatly diminished. Look now! The psychic emanation contains some proportion of every principle composing the soul – motion, life sensation, ethers; essences, vital magnetism, vital electricity, instincts – and, much enlarged by accessions, it has floated up in a compact mass, and now occupies a higher altitude near the ceiling. “Now the lungs have ceased to breathe, the pulse is still, the physical heart is motionless; while the brain cells, the corpus callosum, the medulla, and the spinal cord and ganglia, are ablaze with contractive and expansive energies, which gently pulsate and seem to direct and govern themselves by a kind of automatic self-consciousness. See! The negative (gray) substance of the brain is interiorly throbbing – a slow, measured, profoundly deep throb – not painful, but massive and harmonious like the deep heart-beat of the sea. “Look up! The exalted emanation, obedient to its own changeless laws, is now elongated, and has attained a position at right angles with the horizontal body below. Behold! See how the outline of a beautiful human form is being fashioned within that emanation. Beneath it is still tied by a white life-cord to the medulla and the corpus callosum within the brain. “You observe that a very fine vitalic thread still connects the vortices and central fibers of the dying brain with the lower extremities of the exalted outlined human being in the atmosphere. Notwithstanding the existence of this life thread, which acts like a telegraphic conductor – conveying messages in opposite directions at the same moment – you observe that the shadowy image enveloped in a golden emanation, continues almost imperceptibly to ascend skyward. “There! What do I now see? A symmetrically shaped human head rising above the mass – slowly, beautifully rising out of the golden cloud of substantial principles. And now appear the outlines of a spiritual countenance – a quiet face and full of beauty, surpassing the power of words to delineate. Look again! behold emerging the fair neck and beautiful shoulders; and see! as we gaze, out come one after the other, in a rapid succession, as if influenced and directed by the wand of a magician, all the parts of a new body – a bright, natural looking, yet spiritual image – only a little less than the deserted physical body, a perfect re-appearance of the person in the immediate heavens, prepared to accompany the celestial group of superintending intelligences to the Summerland. “Here now behold a true, substantial, immortal, spiritual body. It was sown in darkness and dishonor; it is raised in beauty and brightness. Behold the contrast – the vastly wide difference – between the interior and outward. Cast your eyes around the room. There are many friends, aged relatives, and little children, in the death chamber; they mourn, without the comfort even of blind faith; they grieve, with only the whisperings of hope to the doubting ear; they gather around the prostrate, cold body; they press together the lids of the sightless eyes; in silence and in sorrow they withdraw from the scene; and now other hands commence those final preparations with which the living consecrate the dead. “But let us open our brighter eyes – the eyes that we shall all have when clothed with the deathless garment of immortality. See! The newly organized spiritual body – surrounded by a group of guardian angels – moves gracefully off in the direction of celestial shores. The arisen personality follows a vibrating thread of magnetic attraction, which while the dying mutations were in process we noticed penetrating the apartment and fastening itself to the earthly brain of the resurrected. It comes floating down from the sensorium of superior intelligences – a golden fibrillous stream of telegraphic light – sent from on high, to greet with love and guide with wisdom the newly arisen. The thought-laden love-thread tranquilly draws the new born higher up and farther away. The death scene ,created by Andrew Jackson Davis is fascinating me. I am a writer and poet . I create a poem in urdu language and say ” o death ! you are so beautiful,you free us all miseries of the world. My mother and I were very close. She passed a week before Christmas, 1969, when I was 23. On January 4, I went to my parent’s home to go through her personal affects, at my father’s request. I remember being in her closet, and the smell of her on her closed was particularly moving. I was about 6 months pregnant and had two small children who I had brought with me. Because My great Uncle was visiting after the funeral, sleeping accommodations were out-of-the-usual. I was asked to sleep in my brother’s room, in a twin bed with my 4-yr-old son, my great Uncle in the other twin bed. This was Florida, and a sheet for covering was all that was needed. I was wakened to pull up the sheet my son had kicked off and heard the mantle clock chime 2:00 am. Sometime later, I again had to retrieve the sheet and saw, at the foot of my bed, a “being” clothed in a white “dress” with a pattern the color of “old rose” spaced diagonally over the “skirt”; my gaze traveled up from the bed and I saw a sash of the same “old rose” color just below where the bust would be. Above, where one would expect a face, was a source of light that was not steady, but ‘working’, and from this proceeded massive beams of a golden-colored light. These came off in all directions. I noticed i could see between the beams but not through them. Where a beam impacted the wall, I could see out into the back yard, all the bushes, grass… just as if through a window. This all took less than a minute. I then looked into the source of the light and was thrown back against the headboard of the bed. I know this was not a dream; I am very near-sighted, and I could not make out the figures on the dress; they could have been flowers or anchors or geometrics. In a dream, I always have excellent vision. After the forceful slam to the headboard, I found myself in a gray, misty place where I was introduced to many, many people who seemed to know me and care for me, but I did not know them. I was called back to the bedroom by the mantle clock striking 5. At this time in my life, I was rather skeptical of anything spiritual, having been raised in a Roman Catholic tradition and finding that very disagreeable. I did not assume that this was my mother, but now, at 68, I understand that she wanted to spare me the life I have had, take me with her and keep me safe. I think she knew I would lose that baby full-term and she would not be there in the body to help me. Also, I have had three failed marriages of ten years each, found the love of my life at 51, had congestive heart failure with extreme cardiomyopathy, then TB of the spine, then my beloved husband died, I was retired at age 63 and have had breast cancer since that. My mother has watched over me and I believe she has saved my life and the lives of each of my children in separate instances. My deceased husband is with me continually. For the first six months, he sent me messages which resulted in the word or idea “together”. I now where a pin that says “TOGETHER FOREVER”. I know it is true. One other event, if you don’t mind. Three months after his death, on ‘good Friday’, he woke me in my bed and I could sense him lying above me. He slid into my body and I could smell him and had the experience of feeling what it is to have the energy males take as normal. He did things with my arms that were typical of him, not me. The possession only lasted about 5 minutes, though my sense of time in that state was not precise. Many times these days, I feel he overshadows me. I find myself speaking as he would have. He died so suddenly, only 59 years-old. I had said to him not long after his death that he should use my body if he needed to do something he had left undone. I meant for him to direct me to do it for him. We were kindred spirits. So many synchronicities and similarities; we even had the same birth surname. in many areas. On my first night-shift I saw a dying patient’s Spirit leave the upper-centre of the chest and turn upwards.I have since been studying the human experience of dying, by observation and sharing with them. Particularly moved by Davis’ vision of many spiritual bodies rising about a Civil War battlefield. This report must have been comforting to the multitude of relatives mourning soldiers slaughtered in that bloody war. The prose Andrew Jackson Davis writes is replete with beautiful and inspiring poetry. Being a member of (www,iands.org) since 70’s have read many dead scenes, this another versions, maybe best I’ve read however. Will forward on have large number of like minded friends.